The effects of herbs and aloe have remained a mystery of nature for thousands of years. Throughout history people have supported the use of aloe and herbs to help relieve headaches, upset stomachs and many other ailments of the body. Even though there is little laboratory evidence to support claims made through the years, there is likewise no hard evidence to the contrary. Highest quality imported, natural Aloe Vera. A nutritional drink enhanced with two of the most widely used of all herbs. Ingredients: Aloe Vera, Fructose, natural flavours, Chamomile, Ginseng, Citric Acid, Sodium Benzoate and Potassium Sorbate. So-called “folk” remedies have proliferated throughout the many ages of mankind. In fact, almost the entire development of what we now refer to as “modern” medicine has taken place in the last two centuries, and most of that in the past fifty years. Two hundred years of giant strides have unquestionably lengthened life expectancies and provided many preventive solutions to age-old maladies. But, somehow the human species has survived, and often thrived, for thousands of centuries without the benefits of “modern” medicine. How could that occur? Because nature, which provides man with materials for nutrition (food), materials for shelter (wood, mud, stone, etc.)... materials, in fact, for every aspect of life (water, air, sunlight, etc. ), also provides man with materials for renewal and rebuilding (penicillin, for example, may be refined and processed from simple bread moulds). It is highly probable that the Aloe Vera plant of today differs very little from its form when dinosaurs roamed the earth. It is speculation, of course, but it is not too difficult to imagine early man gratefully rubbing the Aloe Vera juice on the badly damaged skin he must certainly have suffered in his first fumbling attempts to master the use of fire. Somehow, a belief in the properties of Aloe Vera has apparently followed mankind throughout the time of his reign on earth - all the way to the present. 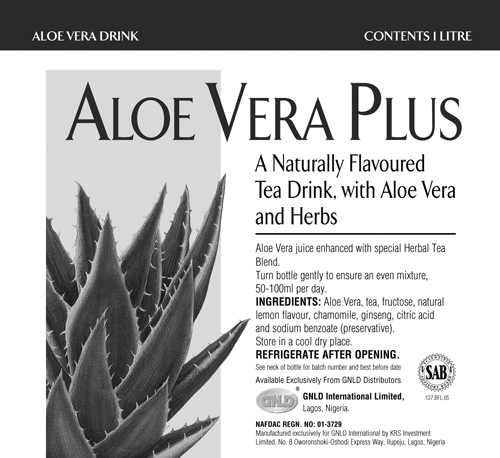 Aloe Vera users today acclaim an almost unlimited variety of applications. What is the truth about Aloe Vera? The truth is - nobody really knows. The “mystery” of Aloe Vera remains a scientific riddle after centuries of intensely concentrated research in many countries all over the world. Yet, ever-greater numbers of people swear by it for relief of a wide variety of ailments and general restoration of vitality in old, tired bodies, and the like. Does it work? For thousands of years millions have thought so... yet the mystery remains. GNLD makes no claims for the functions of GNLD Aloe Vera-Plus beyond its exceptional purity, safety and consistency. They painstakingly processed this wholly naturally occurring product and added herbal extracts of Chamomile and Ginseng, all used and cherished throughout man’s history. They then put the GNLD name and reputation behind it - even though there is very little hard laboratory evidence to substantiate the myriad of claims made by millions of users over a period of many recorded centuries. Why? Because there is absolutely no hard evidence to refute those claims. And every once in a while - rarely - the tides of scientific acceptance are turned by the tidal wave of public acceptance. GNLD’s Aloe Vera-Plus. It just might make you a believer! People often try to solve their physical and mental problems created by day-to-day pressures by turning to alcohol and drugs. The medical community tries to solve this situation by recommending prescriptions for various drugs. This can often lead to the greater problem of drug dependency. Today, people around the world are turning, as they have for centuries, to naturally occurring Aloe Vera products in an effort to deal with some of the negative elements associated with modern lifestyles. Knowing this to be the case and knowing of Aloe Vera’s illustrious history, GNLD has applied that knowledge and developed GNLD Aloe Vera-Plus. But, as the name implies, this product goes beyond providing the benefits of naturally occurring Aloe Vera by including herbs for their folkloric benefits and fructose to offer quick energy. Aloe Vera-Plus is specially formulated and targeted to help your body overcome the impact brought on by today’s active lifestyle.